A LEADING investment strategist has warned that this summer's sharp drop in emerging-market currencies points to a return of the 2008 global crisis, with stock markets tumbling and the gold price heading for $10,000 per ounce. "I see the current [emerging market] FX turbulence leading to a renewed global recession," writes Albert Edwards at French bank Societe Generale. What he called "waves of deflation" will hit the developed West from Asia, "as China is ultimately forced to devalue [the Yuan] in the face of an unrelenting loss of competitiveness, most especially against its EM rivals." This turmoil will push the US stock market into the "third major leg" of its "structural bear market", says Edwards, forcing the US Fed to reverse its plan to end quantitative easing and start purchasing yet more bonds with newly-created money instead. "At the risk of being called a crackpot again," says the SocGen strategist, "I repeat my forecasts of 450 for the S&P, sub-1% US 10-year Treasury yields and gold above $10,000." 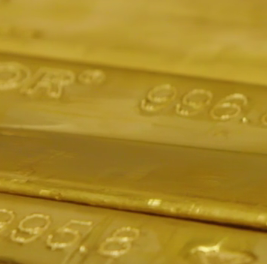 Albert Edwards first made that call for $10,000 gold in late 2009. 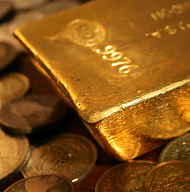 He recently repeated it in late April this year, just after the first of two gold price crashes knocked the metal below $1400 per ounce – their current level – for the first time in two years. 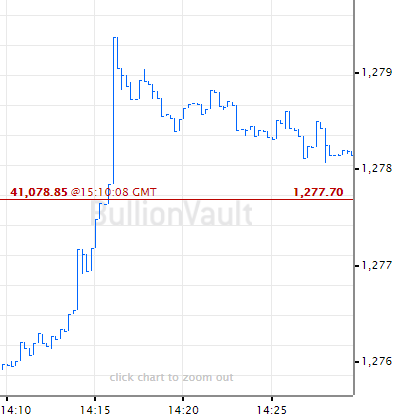 End-June's slump then saw the gold price bottom at a 3-year low of $1180. Noting that he warned on a balance of payments crisis leading to a repeat of the 1997 Asian meltdown as long as ago as late 2012, Edwards quotes former colleague Dylan Grice – now at Edelweiss Funds – who says that being one step ahead with a financial forecast makes one a "genius", but being two steps ahead makes one a "crackpot". With world #1 gold consumer India now suffering record drops in its currency, the Rupee, "The emerging markets 'story' has once again been exposed as a pyramid of piffle," SocGen's Edwards now writes. "The EM edifice has come crashing down as their underlying balance of payments weaknesses have been exposed first by the Yen's slide and then by the threat of Fed tightening."